The dredge machine is in operation on Storm Lake. Boaters should use caution and stay clear of the dredge machine, booster pump barge, and pipeline. Channel Catfish – Fair: Try shrimp, dip bait or cut bait. Walleye – Fair: Some keepers and slot fish are being caught trolling cranks. Northern Pike – Fair: Anglers using spinner baits near weed edges have been catching a few harvestable size fish. Largemouth Bass – Fair: Soft plastics and spinner baits worked near vertical structures should produce a few decent bass right now. Walleye – Slow: Harvest has been slow but a few anglers are having good success with live bait presented VERY slowly. Let the action of your leech or shiner bring in the fish, don’t be drag racing them around the lake. Channel Catfish – Good: Cut bait, chicken livers, and stink bait presented in the evenings and overnight hours is producing a number of nice aggressive catfish for anglers. Bluegill – Fair: Small ice jigs tipped with red worms or other live bait when presented near weed lines is producing some angler acceptable fish right now. Early morning seems to be when most folks are fishing these spots. Yellow Perch – Fair: Pilkies tipped with red worms worked near rocky points have been producing a few nice perch. Be prepared to sort some small ones, but anglers can count on keeping some for the freezer. Walleye – Fair: Anglers with the best success are working deeper areas with both live bait rigs and deep running crank baits. Trolling across the deep ends of structure is producing a few nice keepers. Make sure to slow your presentation way down when using live bait, fish have been hitting very softly. Yellow Bass – Good: Deep weed lines and structures are providing the best action to anglers who use small jigs tipped with live bait. Bluegill – Good: Tiny jigs tipped with live bait have been producing a few keepers when worked near the edges of weed beds. The bite seems to be best at first light. Yellow Perch – Good: Smaller fish need to be sorted out, but red worms tipping a pilkie have been producing some nice action for anglers. Walleye – Fair: A few walleyes are being harvested from rocky points using leeches and crawler rigs presented slowly. Lots of folks have been fishing these areas at first light until 9 a.m. or so. Yellow Bass – Good: Small jigs tipped with wigglers will get you some nice action. Elsie Stachour age 97 of Sibley, IA died Sunday, August 24, 2014, at the Country View Manor in Sibley. Funeral service will be 1:30 p.m. Wednesday, August 27, 2014 at First Presbyterian Church in Sibley with Reverend Terry Simm officiating. Burial will follow in the Holman Township Cemetery of Sibley, IA. Visitation will be Tuesday, August 26th from 4:00 to 8:00 p.m. at the Jurrens Funeral Home of Sibley. Elsie Gertrude Dreessen, the 5th child of Herman and Anna Marie (Reinholdt) Dreessen, was born on July 5, 1917, in rural Osceola County, Wilson Township, section 30, 3 ½ miles north of Sibley. Elsie received her elementary education at Dunton School of Wilson Township, and her secondary education at Sibley High school, graduating with a Normal Training (teacher’s) certificate. She taught full-time in the Osceola County rural schools for 5 years and as a substitute teacher in both Sibley and Osceola County rural schools from 1940 to 1964. She was President of Osceola County Rural Teachers in 1939-40. Elsie married Donald Stachour on June 02, 1940 in the First Presbyterian Church in Sibley; the first wedding in the new (1939) church building. Except for 14 months spent in Arkansas and Texas while Don was serving in the US Armed forces, she lived in Osceola County all of her life. Elsie began work with the U.S. Bureau of the Census on March 29, 1964. She worked on 23 different programs over a 21 year period, retiring from Federal Service in February 1985. Elsie and her husband Don were parents of three children Paul, Dennis and Donna. They were blessed to have 7 grandchildren, and 7 great-grandchildren. Elsie was very active at 1st Presbyterian Church, beginning as a member of the Junior, and later the Senior, choir. 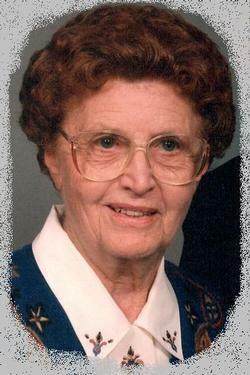 She taught Sunday school from 1935 to 1998. She was active in Presbyterian Women where her local involvement included 4 times as President and 2 times as Secretary plus synodical work as literature secretary and nominating committee. She was elected as an elder in 2001 where she served as chairman of both the Nurture & Stewardship and Hospitality committees. Besides her work with cub-scouts and girl-scouts when her children were growing, Elsie also served her community as a literacy tutor from 1988 through 1998, teaching people 35+ years old to read. For her literacy work, in 1990, Elsie received the “Osceola County Volunteer of the Year” award from Iowa Gov. Branstad. Elsie also served on local and area hospital planning and study commissions. Always thinking about education, she served (1993-1995) on the planning committee for the first Sibley / Ocheyedan High School reunion. She and husband Don were still doing “Welcome Wagon” and delivering “Meals on Wheels” well into their 80’s. For much of her adult life Elsie sent letters and cards to dignitaries from all over the world and received many responses that were kept in large albums. Her letter collection was recently donated to the Iowa Historical Society in Des Moines where it will be cataloged and eventually available for online viewing. During her lifetime, Elsie embroidered hundreds of dish towels (sets of 7) for “brides to be” as bridal shower gifts. Each set included a message from the design in the corner of each towel. Elsie was known for her ability to converse and interact with people of all ages. Within a 10 minute period, she might have talked about a new sister with a 3-year old boy, about food choice with an 82-year old woman, about college plans with an 18-year old high-school girl, and corn crop status with a 45-year old man. Elsie was preceded in death by her parents, all 7 of her siblings: sisters Emma Boom & Marie Roos; brothers John, Ervin, and Melvin Dreessen; twin brother and sister Lloyd and Lorraine who died in infancy; and son in law Ken Kekich. She is survived and mourned by her loving husband of 74 years Don; son Paul (Frances) of Bloomington, MN; son Dennis (Margaret) Stachour of Apple Valley, MN; daughter Donna Kekich of St. Paul, MN; 7 grandchildren: Valerie Stachour, Ann Vensland (Dave), Elizabeth Santos (Filipe), Frank Stachour (LeeAnne), Steven Kekich, Charles Stachour, and Brian Kekich; 7 great grandchildren: Avery, Ben, Noelle, and Lindsey Czarnecki and Gabriel, Michael, and Abigail Stachour; two sisters in law: Mildred Dreessen and Gertrude Swalve; many nieces, nephews, cousins and friends. Sibley, Iowa — Northwest Iowa has a brand new John Deere sales and service facility, and the Governor of Iowa came to cut the ribbon. Noteboom Implement in Sibley has just opened a nearly $2.5 million dealership and service facility on the edge of Sibley, on Highway 60. The project was almost a year in the making. Governor Terry Branstad was on hand to cut the ribbon along with a number of local and state dignitaries. He says it’s a good thing for Sibley and northwest Iowa. Noteboom Implement has five other locations including three in South Dakota, one in Lake Park, and one in Spencer. We had a chance to talk to Noteboom CEO Dan Noteboom and we’ll hear from him in future stories on osceolacountydailynews.com. The dredge machine is in operation on Storm Lake. Boaters should use caution and stay clear of the dredge machine, booster pump barge, and pipeline. Channel Catfish – Fair: Try shrimp, dip bait, or cut bait. Walleye – Fair: Some keepers and slot fish are being caught trolling cranks. Northern Pike – Fair: Anglers using spinner baits near weed edges have been catching a few harvestable size fish. Largemouth Bass – Fair: Soft plastics and spinner baits worked near vertical structures should produce a few decent bass right now. Walleye – Slow: The best action has been on live bait presented very slowly near weed lines and rocky points. Overnight anglers using leeches under a lighted slip bobber have been finding a few 16 inchers shallow. Muskellunge – Good: Quite a few nice muskies have been caught on Big Spirit the past couple weeks. Channel Catfish – Good: Cut bait, chicken livers, and stink bait presented in the evenings and overnight is producing a number of nice aggressive catfish. Bluegill – Fair: Small ice jigs tipped with red worms or other live bait when presented near weed lines is producing some angler acceptable fish. Early morning seems to be when most are fishing these spots. Yellow Perch – Fair: Pilkies tipped with red worms worked near rocky points have been producing a few nice perch. Be prepared to sort some small ones, but anglers can count on keeping some for the freezer. Walleye – Fair: Anglers with the best success are working deeper areas with both live bait rigs and deep running crankbaits. Trolling across the deep ends of structure is producing a few nice keepers. Yellow Bass – Good: Deep weed lines and structures are providing the best action to anglers who use small jigs tipped with live bait. Bluegill – Good: Tiny jigs tipped with live bait have been producing a few keepers when worked near the edges of weed beds. The bite seems to be best at first light. Yellow Perch – Good: Fishing has slowed a little bit but anglers are still catching quite a few perch by working deep weed lines and rocky structures with live bait. Walleye – Fair: A few walleyes are being harvested from rocky points using leeches and crawler rigs presented slowly. Lots of folks have been fishing these areas at first light until 9 a.m. or so. Yellow Bass – Good: Small jigs tipped with wigglers will get you some nice action. The Master’s Voice Quartet will present a concert of gospel music at Ocheyedan Christian Reformed Church, located at 833 5th Street, on Sunday Evening, September 7th at 6:00 pm. Refreshments will be served and a freewill offering will be taken. Come to an Open House and informational meeting about the Emerald Ash Borer (EAB) and learn how communities are responding to this threat to community forests. Kent Wallin, age 54, of rural Melvin, IA passed away at his home on Wednesday, August 20th. A visitation will be held on Sunday, August 24th, from 1:00 to 3:00 p.m. at the Sanborn Funeral Home Chapel in Sanborn, IA with the family present at that time. Following the visitation family and friends are invited to Baxter’s Bar & Grill in Primghar, IA. In lieu of flowers the family wishes that memorials in Kent’s memory be given to them for a charity of their choice at a later date. The Sanborn Funeral Home is in charge of the services for 54-year old Kent Wallin of rural Melvin. Kent Leslie Wallin, age 54, passed away on Wednesday, August 20, 2014 at his home near Melvin, IA. He was born the son of Floyd and Luella (Bay) Wallin on January 5, 1960, at Primghar, IA. He lived his youth in the Germantown area, and attended grade school at St. John’s Lutheran in Germantown. He received his high school education at Paullina Community School, graduating with the class of 1978. Following graduation, Kent farmed with his brother, Craig. On August 24, 1985, Kent was united in marriage to Chirstine Kay Crouse at Paullina, IA. In 1986, they began farming together on their own. Two daughters were born to this union: Leah Mae and Erin Lynn. Along with farming, Kent also had the Sioux City Journal dealership from 1985 to 1999. When the farm work would allow, Kent enjoyed riding motorcycle in the summer months, taking several trips to the annual Sturgis, SD Motorcycle Rally. He was a also a member of ABATE. The long winter months were a good time to take off and do some traveling. Kent also enjoyed doing woodworking projects. His true passion, however, remained agriculture. Left to cherish his memory are his wife, Chris Wallin of rural Melvin, daughters: Leah Wallin of Milford, IA, and Erin Wallin of Sioux City, IA; his mother, Luella Wallin of Paullina, IA; one sister, Pam List; one brother, Craig Wallin; and his faithful black lab, Bo-Bo. Preceding him in death was his father, Floyd Wallin. · National studies show that up to 30 percent of hunters that use a treestand without using/wearing the proper safety equipment will fall during their lifetime. · Always wear a safety harness, also known as a fall arrest system, when you are in a tree stand, as well as when climbing into or out of a tree stand. 1 in 2 treestand users do not use a fall arrest device. · A safety strap should be attached to the tree to prevent you from falling more than 12 inches. · Always inspect the safety harness for signs of wear or damage before each use. · Follow all manufactures’ instructions for use of a safety harness and stand. · Follow the three point rule of tree stand safety. Always have three points of contact to the steps or ladder before moving. This could be two arms and one leg holding and stepping on the ladder or one arm and two legs in contact with the ladder before moving. Be cautious that rain, frost, ice, or snow can cause steps to become extremely slippery. Check the security of the step before placing your weight on it. · Always hunt with a plan and if possible a buddy. Before you leave home, let others know your exact hunting location, when you plan to return and who is with you. · Always carry emergency signal devices such as a cell phone, walkie-talkie, whistle, signal flare, PLD (personal locator device) and flashlight on your person at all times and within reach even while you are suspended in your FAS. Watch for changing weather conditions. In the event of an incident, remain calm and seek help immediately. · Always select the proper tree for use with your tree stand. Select a live straight tree that fits within the size limits recommended in your tree stand’s instructions. Do not climb or place a tree stand against a leaning tree. · Never leave a tree stand installed for more than two weeks since damage could result from changing weather conditions and/or from other factors not obvious with a visual inspection. · Always use a haul line to pull up your gear and unloaded firearm or bow to your tree stand once you have reached your desired hunting height. Never climb with anything in your hands or on your back. Prior to descending, lower your equipment on the opposite side of the tree. · Always know your physical limitations. Don’t take chances. Do not climb when using drugs, alcohol or if you’re sick or un-rested. If you start thinking about how high you are, don’t go any higher. It was not hard to see why the mourning dove is the most populous game bird in North America. As we bounced through the picked field, 30 or 40 lifted off ahead of us and to the sides; winging away from the millet-baited wire traps that held seven or eight less wary doves. Yet, this handful of birds and a few more in the next set of wire live traps would bring the DNR wildlife crew from Otter Creek Wildlife Area in Tama County to their banding goal of 100. And over the next day, they would fit another 80 with tiny aluminum leg bands, to pad their quota. “You never catch them all. There are so many doves and we’ll catch only a small percentage,” explained wildlife technician Rodney Ellingson. Setups across Iowa in August yield similar results…where 2,000 banded doves is the goal for this summer. Since 2003, 18,000 doves have been banded and released in Iowa. As any are harvested or recaptured, those bands tell wildlife biologists a lot about where the birds nest, age structure, their migration habits and just how many mourning doves are out there. Even in mid-August, doves were on the move. That is what hunters want to see, with Iowa’s dove season opening September 1. The state’s newest season, hunters are still ‘trickling’ into the dove fields; as more learn how to hunt the elusive, fast moving game bird. Regionally, the 2013 estimated dove population in the Central Management Unit was 141 million. Scouting is important for successful dove hunting. Many of the better areas are along food plots on public hunting areas and on private fields enrolled in IHAP—Iowa’s Hunter Access Program. Sunflowers have proven most popular in the first three seasons. Contact the area wildlife biologist for locations of dove plots. Observations by field staff indicate an abundance of doves this fall. Visit http://www.iowadnr.gov/Hunting/MigratoryGameBirds/MourningDoves.aspx for more information. Iowa’s mourning dove season runs through November 9, 2014. The daily bag limit is 15 doves (Mourning and Eurasian Collared combined) with a possession limit of 30. Shooting hours are half hour before sunrise to sunset. Dove hunters are required to register with the federal Harvest Information Program (HIP). Hunters can register with HIP online or thru any license agent. Go to http://www.iowadnr.gov/Portals/idnr/uploads/Hunting/migratoryregs.pdf for information.